GLD Remote connects to the GLD-80 mixer on a wireless network and gives the user instant access to any of the mixers channel faders and mutes, DCA faders and mutes, image controls, aux sends and assignments as well as channel input and output processing, mic-pre control and full metering. Whereas most other apps on the market offer limited control over the channel processing, GLD Remote gives control of high pass filters, gates, parametric and graphic EQ, compressors and input/output delays. 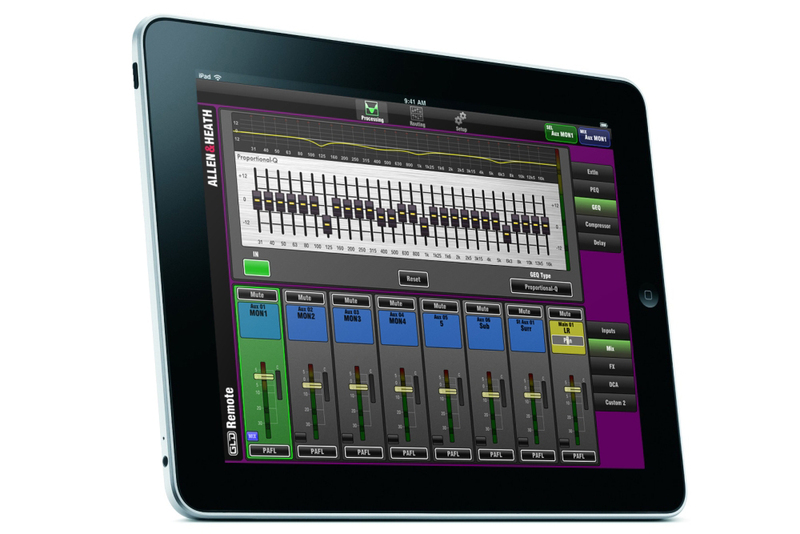 Other features for system setup include a real time analyser (RTA) to ring out monitors and EQ the PA, the facility to name and colour channel strips, custom layers with drag ‘n drop strip setup to suit any application, and a mix view where monitor engineers can keep both master levels and contributions under control in a single screen. Additionally, GLD Remote provides channel PFL control to enable the engineer to remotely listen to feeds using a wireless monitor system. For more on apps for the pro-AV market, see our March/April issue, out next week.